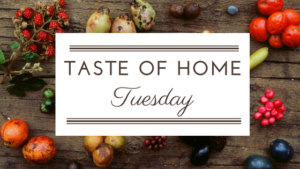 It's Taste of Home Tuesday, as organized by Maureen from Red Cottage Chronicles.......so be sure to check out all of the other delicious recipes at the bottom of this post! They were starting to become overripe and I was in trouble! Preserves always bail me out when the fruit flies are looming like little vultures. This recipe, from Taste of Home, is a perfect way to use up pears. 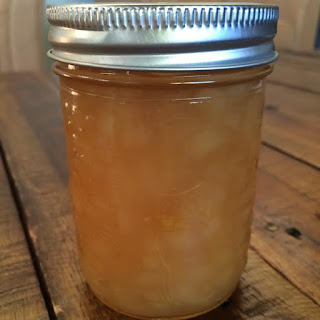 It also has no pectin. It had no reviews when I tried it, which is crazy, because it's a gem! You can find a link to the recipe, here. I copied it below, making slight alterations for the fact that I halved the recipe. 1. In a stockpot, combine pears, sugar, water and lemon juice; bring to a boil. 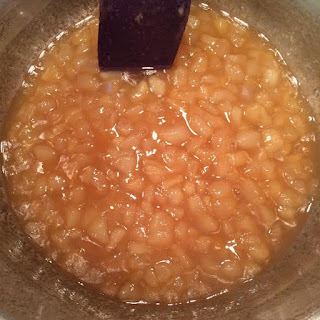 Cook, uncovered, 1-1/2 to 2 hours or until mixture reaches a thick, spreadable consistency. 2. Remove from heat. Ladle hot mixture into three (original recipe says 7) hot half-pint jars, leaving 1/4-in. headspace. Remove air bubbles and adjust headspace, if necessary, by adding hot mixture. Wipe rims. Center lids on jars; screw on bands until fingertip tight. 3. Place jars into canner, ensuring that they are completely covered with water. Bring to a boil; process for 10 minutes. Remove jars and cool. Editor's Note: The processing time listed is for altitudes of 1,000 feet or less. Add 1 minute to the processing time for each 1,000 feet of additional altitude. 2 tablespoons: 79 calories, 0g fat (0g saturated fat), 0mg cholesterol, 1mg sodium, 21g carbohydrate (18g sugars, 1g fiber), 0g protein .